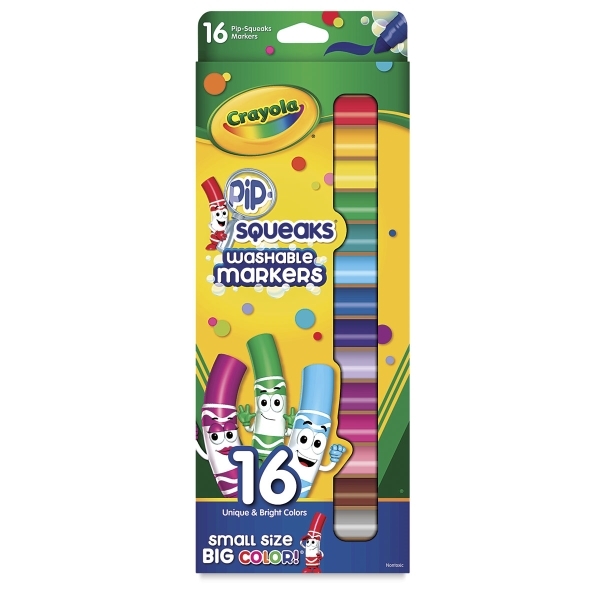 These endearing Pip-Squeaks Markers from Crayola are small in size, but BIG in color! A shorter version of Crayola’s full-size washable markers, the easy-to-hold, short barrels are scaled to fit little hands. The ink is Crayola’s special washable formula, so cleanup is a breeze. This set includes Leprechaun Green, Golden Nugget, Raspberry Squirt, Petite Rose, Tiny Plum, Teensy Teal, Rain Drop Blue, Copper Penny, Dinky Pink, Firefly Red, Toy Poodle Black, Mini Brown, Kitten Gray, Little Lemon, Sweet Violet, and Little Boy Blue.